Mary Auld Photo Deb Chapman, Penny Nord, Ken Rasmussen and Tom Philips find trash on Jocko Road. 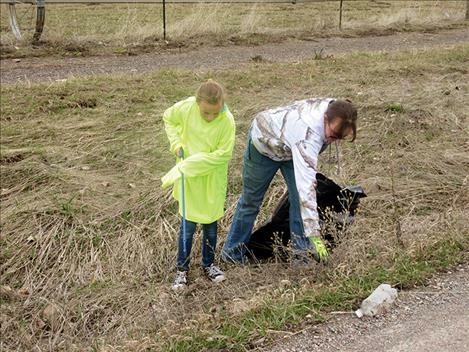 Toni Hadley, Dvaiah Gasco and another volunteer clean up trash on Jocko Road. 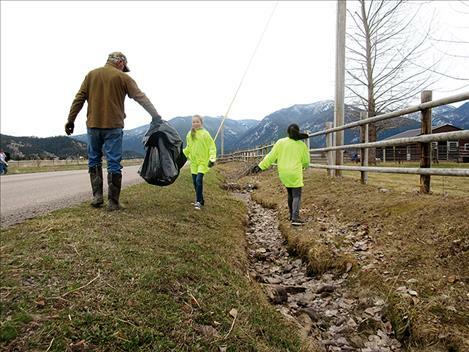 ARLEE – Neon green vests dotted the roadsides as community members beautified Arlee by picking up trash on Saturday. Merrill Bradshaw attended the cleanup. He said he has been picking up roadside trash in Arlee annually for nearly all of the 40 years he’s lived in the community. “There’s a normal amount of trash this year,” he said. The Arlee Community Development Corporation facilitated the event. Bradshaw said he was pleasantly surprised by the number of volunteers who attended the cleanup. According to the Arlee CDC’s Facebook page, more than 45 people helped with the cleanup. “It is a very good turnout,” Bradshaw said. 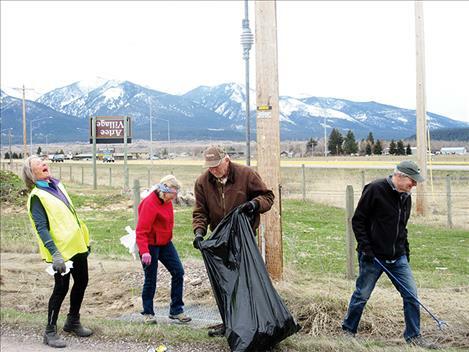 The group gathered at the Hangin’ Art Gallery for scones, coffee, and cookies at 10 a.m. Then they broke into groups to tackle the roadside trash. Volunteers in pickup trucks retrieved the bags of trash that were collected. One of the trucks was from the Arlee Volunteer Fire Department. They came in with lights flashing. Litter accumulates when those in passing cars – intentionally or unintentionally – drop their refuse. Bradshaw said much of the trash comes from people who are taking their refuse to the dump but haven’t secured their load of waste. Deb Chapman is part of the Friends of Arlee School group, which puts on the annual Buttercup Run. The intention of the cleanup effort was to improve the raceway for the fundraiser run. The race will be held next Saturday. In addition to beautifying the area, the cleanup allowed people to spend a morning with their community. Families, neighbors and friends worked together. 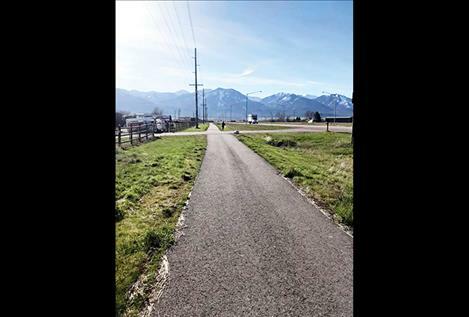 Spirits were high in Chapman’s group, comprised of neighbors who are long-time Arlee residents. The crew joked and showed off some treasures they’d found in the ditches, which were long, sturdy piece of metal and a half-gallon canning jar. Josh Horn worked the event into his birthday celebration. He turned 12 on Saturday and spent the morning cleaning up with his family. Nicole Hadley made a family day out of it, going with her husband, her daughter and her daughter’s friend. 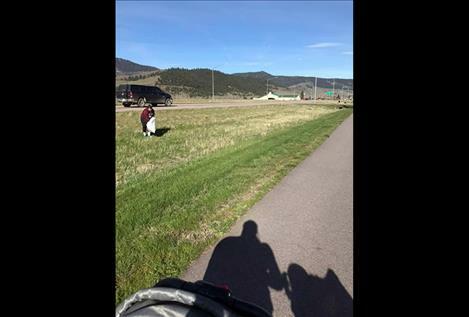 Hadley said the trash on the roadside bothered her, but she hadn’t done any cleanup last year. The community cleanup gave her that opportunity. “I thought this year I’d better get out there,” she said. 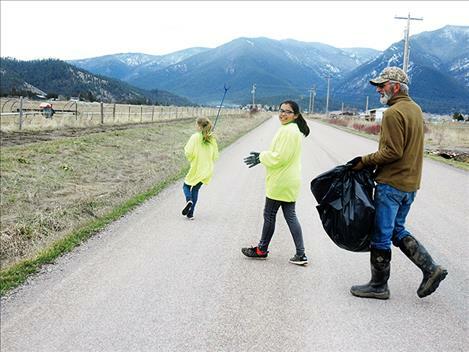 Two and a half hours after the event started the group had cleaned up U.S. Highway 93 from Jocko Road to downtown Arlee, as well as the areas around the walking paths and down Jocko Road. The group filled more than two pickup trucks with trash. Bradshaw said it was clear the crew’s work had improved the area. “It does look a lot nicer,” he said.